Subject matter experts (SMEs) know their duties best! Your Subject Matter Experts (SMEs) are experts at their primary job function, but aren't likely experts in compliance. With the Global Audit-Ready SME Responsibility Report, they don’t have to be. 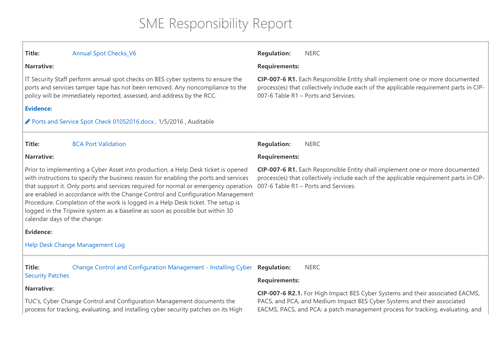 The SME Responsibility Report provides the same capabilities as the Compliance Status Report but is specific to each individual SME. Easy access to the information they need encourages SME's to be proactive and lean-in to compliance. This allows the SME to focus on their primary job function within the organization while maintaining a keen eye on the regulations they are responsible for.